VOA Learning English's "People in America" project tells the stories of living Americans from all corners of the globe, who personify democracy, self-sufficiency, expression and community. Beauty comes in many shades, but some women find their particular shade is underrepresented in the cosmetics industry. Balanda Atis, a chemist with the cosmetics company, L’Oreal USA, hopes to change that. She manages the L’Oréal Women of Color Lab in New Jersey and wants to create makeup that works for all women. Atis, who is Haitian-American, knows from experience how difficult it is for women of color to find foundation makeup that's right for their skin tones. L’Oreal launched a product line for women of color to answer the need, which Atis says was a good thing, but something more was needed. “Although we were excited to see the effort being made, we did notice that there was still the concern of the shades either being too ashy, too red and [they] just didn’t cover a large segment of the population," Atis said. When the head of the division challenged Atis and her colleagues to come up with a fix, they began to explore the possibilities. “We had the opportunity to travel across the U.S, to different regions of the U.S., as well as internationally, such as South Africa, to gather skin tone measurements to make sure that the shades that we were creating were suitable for a large range of skin tones," Atis explained. The information they collected led to breakthrough results. Atis says many Haitian families expect their children to become doctors or nurses, but she knew she didn’t want a career in medicine. Although she always had a passion for science, she wasn't sure how to make a career of it. “When I got my degree in biology I knew I wanted to do something in the science field. I was always interested in science but not quite sure what aspect of science I wanted to go into," she said. Atis eventually landed a job at L'Oreal. "I started off as a chemist working on mascaras, [and] absolutely loved, loved, loved creating mascara and eye products for women around the world so it was a great opportunity to learn and go even further into cosmetics,” she said. 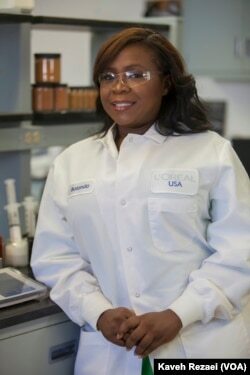 Balanda is happy that she married her love of science to cosmetics. She shares that joy with teenagers by giving talks about the importance of science at schools. Those school visits do not take place solely on U.S. soil. Atis also shares her knowledge and experience with young people in Haiti. “Besides taking care of my two daughters, I really enjoy giving back," she said. "And one of the ways that I give back is I go to Haiti and work with school age kids at a school that we have in the south of Haiti and provide them with education and, then, with medical care." Atis will continue to explore and create makeup products for all women. This story was originally reported and produced by VOA Learning English.